not to say that they aren't always looking; it is only an acknowledgement that during the District Conventions held in August and September of each year, the search gets serious because the governors-elect are chosen at this time. It is a sad but true statement that membership in Optimist Clubs is declining. That means the leadership pool is also smaller and often it comes down to individuals who have hung on the longest are finally being given an opportunity to lead. Let me repeat: those who wouldn't have been considered when there was competition are rising to positions for which they are neither prepared or qualified. And we wonder why membership in our Optimist Clubs is declining? This post is a call to all past and potential leaders. We must not be apathetic or resigned to the path of least resistance. We must not be complacent, resting on past achievements. Successful past governors must step forward to lead again, bringing with them the knowledge and experience that is needed to help the organization and our Optimist Clubs grow. Optimist volunteers may be our greatest asset; however, skilled leadership, focused on growth, is the skill that will take the organization forward long after its 100th anniversary. It is not really a secret, but then again, it is not really being talked about all that much either. On October 1, 2017, Optimist International will officially begin using a new logo. 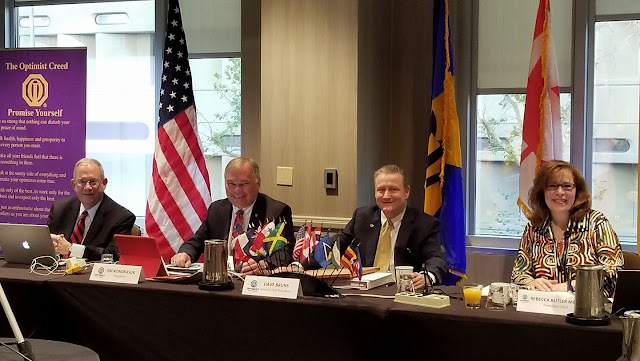 Revealed during the 98th Annual Convention in the summer of 2016, Optimist Clubs, Districts and Optimist International have had a year to use old inventories of stationary and brochures in preparation for the new logo release. This year, at the 99th Annual Convention, attendees saw the new logo wherever they looked - from the Sunport Airport upon arrival in Albuquerque, New Mexico (nice touch! ), to the convention center banners, on the convention stage, and on most handout materials. You might agree that the logo looks familiar. It is very much like the watch that Distinguished Optimist Club presidents receive at the end of a successful year. In addition to the horizontal version seen here, there is also a stacked version where the logo appears above the Optimist International name. Please feel free to save the logo for use with your Optimist Club. We understand that the logos and branding guidelines will soon be available at the Optimist International website under marketing tools. 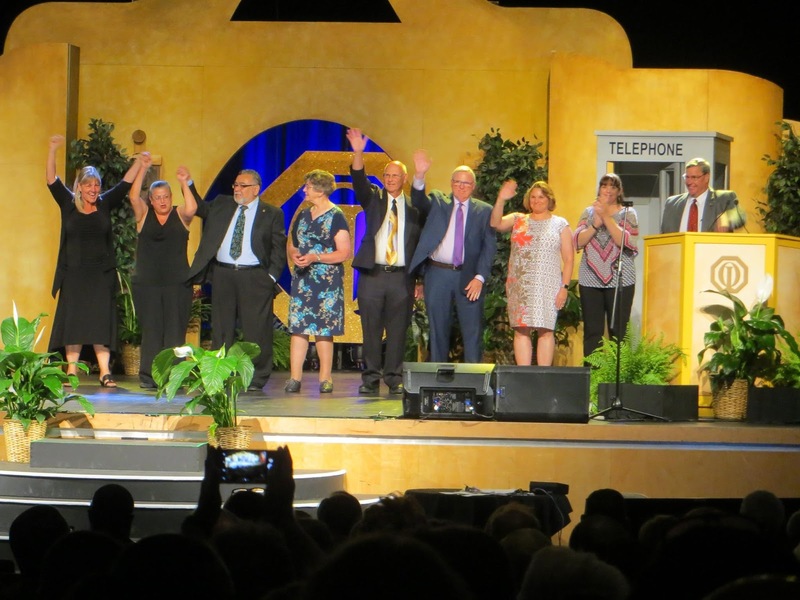 One of the highlights of the Optimist International Convention is to recognize those who will lead the organization's districts in the coming year. For 2017-2018, the PNW District is proud to introduce and celebrate Governor-elect Bruce Gilbertson. Bruce is shown here with President-designate Nick Prillaman (left) and the entire West Coast team (right). The 99th Annual Optimist International Convention was held in Albuquerque, New Mexico July 6-8, 2017. During the event, an International President-elect was announced, the International President-designate was introduced, and the Immediate Past International President was celebrated as the current International President presided over the business and social events. 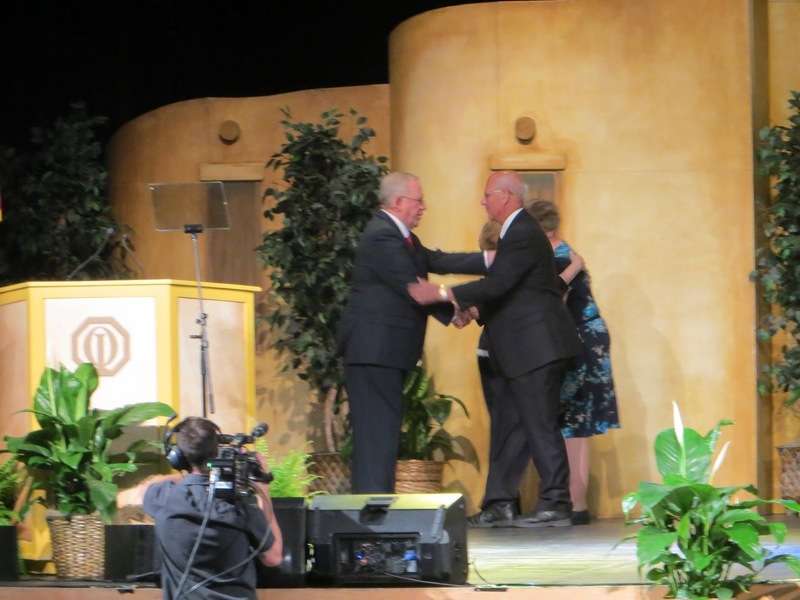 Immediate Past International President Dave Bruns was recognized by the Board of Directors for his service, but not before he had the opportunity to recognize eighteen District Governors who earned the Distinguished Governor recognition in 2015-2016. Vice Presidents Mark Clausson and Mark Harris were also recognized for highest percentage regional growth and new club building. Nick Prillaman, International President-designate, took the stage and presented his introductory speech. Telling a story that went from his childhood to today, he proclaimed that Optimists are heroes, something that we will certainly learn more about in the 2017-2018 administrative year that begins October 1, 2017. Finally, the assembly looked to the future as it was announced that Rebecca Butler Mona was selected as President-elect. She will become Optimist International President on October 1, 2018. Photo courtesy of Rebecca Butler-Mona via Facebook. 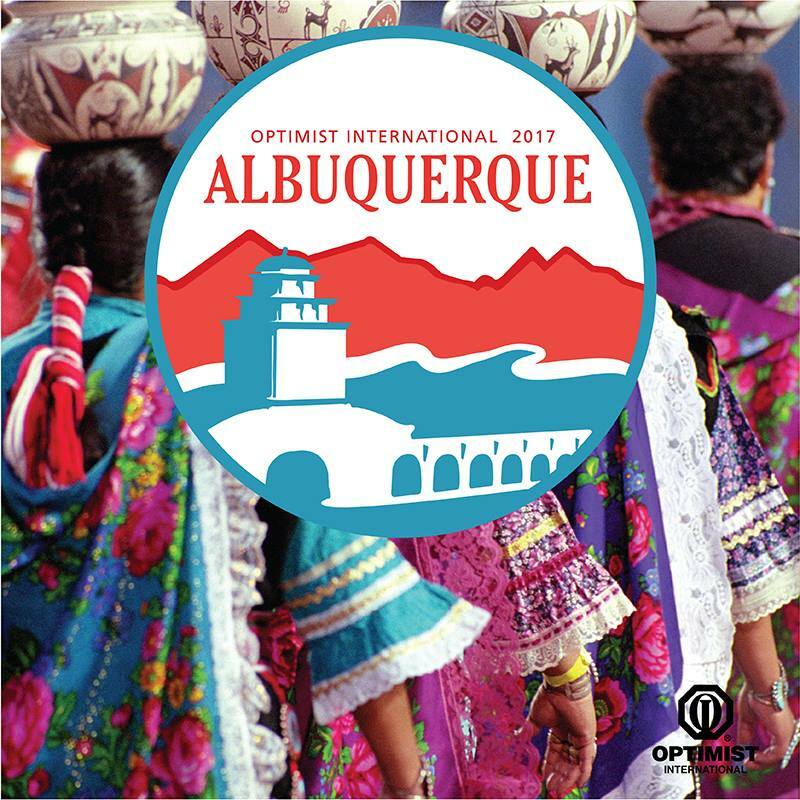 The 99th Annual Optimist International Convention will launch this week, July 6-8, 2017, in Albuquerque, New Mexico. About 1,000 Optimist Club members will attend and lend their voices to the governance of the organization. On the schedule are learning sessions for club and district officers, committee chairs, and general members and the business sessions which honor past leaders and introduce future leaders. Additionally, all attendees will meet with other Optimist Club members for the camaraderie and inspiration of sharing our mutual cause of optimism. Issue 1 - Dues and Fees - simplifies language, emphasizes policy, and changes the tier 1, 2, and 3 countries to developing and non-developing countries. Issue 2 - Reserve Membership - eliminates the category of membership called Reserve Membership. Issue 3 - Friend of Optimist - places the Friend of Optimist member as a category of membership and then exempts the category from club board of directors' actions. Issue 4 - District Secretary/Treasurer - removes the restriction adopted at the 2016 Optimist International Convention that an individual may not serve as District Secretary/Treasurer for more than three consecutive years. Some events will be streamed live from the convention including the Optimist International Board of Directors meeting, July 5, 2017; the Opening Ceremonies, July 6, 2017, and the Business Sessions, July 7 and 8, 2017. Watch online at this link. See the full convention program at this link. Twenty PNW District Optimist Club members are pre-registered to attend including Ben DeRemer who has been selected as part of the Leadership Academy. Be sure to talk to them about their experience and find out what they've learned that will help Optimist Clubs be more successful in our local communities and region.